Soap Opera Digest: You had such a phenomenally successful run on BOLD AND BEAUTIFUL, where you played Ridge Forrester from 1987 to 2012. What are some of your favorite memories? 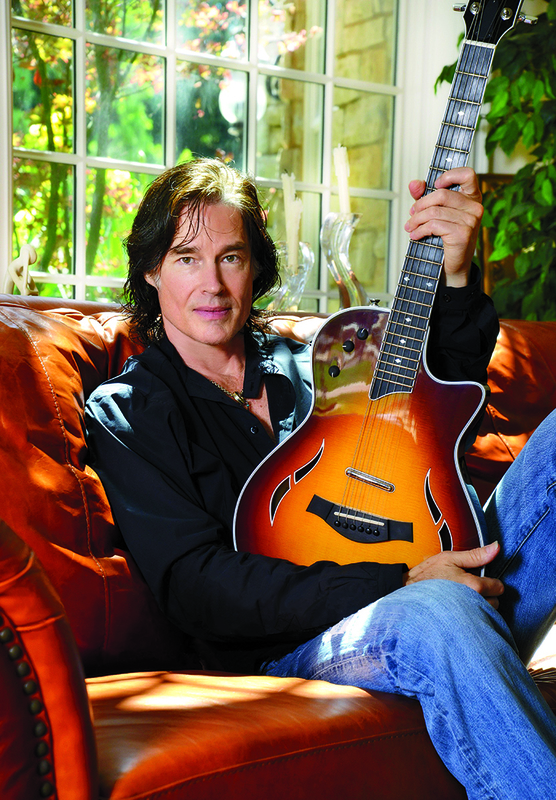 Ronn Moss: I loved working with Katherine Kelly Lang [Brooke], John McCook [Eric], Susan Flannery [ex-Stephanie] and Winsor Harmon [Thorne]. Those were golden memories. Too many to list here. Digest: How would you describe what you felt after leaving B&B? Moss: I guess it was time. I was ready and it was necessary. I miss the people I worked with a lot, but not the everyday grind. Digest: When did it sink in that you didn’t have to report to work at CBS Television City any longer? Digest: What did you do after leaving B&B? Did you get more involved with your music? Travel? Or stay close to home and relax for the first time in a long time? Moss: I’ve been nonstop busy with different projects in different countries. I did an Australian music tour for an entire month, commercials for Italy and Finland, tours each summer with Player, as well as shooting THE BAY and a sitcom called BRUNA IN BEVERLY HILLS. Plus, there are other ongoing projects in the works. Digest: Have you been doing any international appearances or performances due to your worldwide popularity as Ridge? Such as a DANCING WITH THE STARS encore? Moss: I’m due for another Italian appearance soon, but I have been to Belgium, Finland, Italy and Australia since leaving B&B and plan on going back to all of those places soon for other projects that are currently in the works. Digest: What kind of fan mail do you still get? Digest: Which of your former daytime co-stars are you still in touch with? Moss: I still keep in touch with Winsor Harmon, who has been my houseguest recently, Katherine Kelly Lang and occasionally Susan Flannery. Digest: How are things with you and Bradley Bell (B&B’s executive producer and head writer)? Are you in communication with each other? Moss: I haven’t seen or talked to Brad since I left. I hope he’s doing well. Digest: Do you ever tune in to B&B? If so, what do you think of the show? Moss: Because of the time needed to do a show like that, I seldom ever watched it when I was on it. But no, I do not watch it now. Digest: Why did you join the digital drama series THE BAY? Moss: I joined for a few reasons. I wanted to do a quality show with a new character that was written just for me. It was another opportunity to “make it my own.” Our exec producer/writer, Gregori J. Martin, basically told me the context of the story and what would be my character, and it felt right to me. Plus, there was an opportunity to help produce the show, which was very attractive to me. I must admit, it’s been fun getting two Emmys the last two years. Digest: Do you enjoy being part of the serial format again? Moss: I do like the ongoing storyline format. And since THE BAY is technically a prime-time show now that it’s on Amazon Prime, I prefer calling it a prime-time dramatic series. So far, it’s been great being a part of THE BAY. With every season, it just seems to be getting better and better. Digest: In your own words, how would you describe your character, John Blackwell? What about him do you like to play? Moss: John Blackwell is a dark character. He even wears black until they come up with something darker. He’s got a lot of weight on his shoulders because he’s trying to clean up Bay City. His technique for doing that makes him badass. I like playing a much heavier, determined, focused character. He’s both good and bad, depending on how you look at it. Digest: Your music is very important to you. Are tour dates coming up for Player? Moss: We have a ’70s cruise to Mexico with other acts, Peter Frampton, Orleans, Firefall and Ambrosia, to name a few, that will be in March of next year. I just finished a summer tour with a lot of those bands here in the USA. I do have some solo tour dates in Belgium next summer and fall to look forward to. Digest: What was the wildest thing to happen to you when Player was first a huge success? Digest: To what do you credit the longevity of Player? Moss: “Baby Come Back” has stood the test of time for four decades and it seems to be a song everyone knows. My music relationship with Peter Beckett is still on-going and I do keep in touch with the other original members of Player, as well. It’s probably a combination of our collective love of making music and being as tolerant as we can of each other. It’s always interesting being in a rock-and-roll band. Digest: You experienced rabid fan adoration as a member of Player, then again for B&B. Do you miss that mass hysteria? Moss: I feel blessed to have experienced the reactions of so many people around the world to both my music and the TV show. The tour dates I’ve been doing the last few years show me that the fans are still excited to see us in concerts. And yes, sometimes there still is a bit of hysteria. All in fun. Digest: Could you give us updates on your daughters, Creason and Calee? Also, are either of them interested in an acting or music career? Moss: Creason is in her final year of college and majoring in Film Production. Calee is a senior in high school and sings, plays guitar and wants me to teach her to play bass. They are beautiful, smart girls and I’m very proud of them both. Neither one is interested in on-camera work. Digest: To what do you credit your successful marriage to your wife, Devin? Moss: We have been together 12 years and just celebrated our seventh wedding anniversary. I still bring her a “Ronnaccino” every morning and that puts a smile on her face, which puts a smile on mine. We spend a lot of time working on various projects together and she is also a producer on THE BAY. We are a very active couple socially and Devin is quite savvy with social media, so she tends to be my greatest cheerleader. She’s also an amazing chef. I think the success of marriage longevity is communication and quality time together and we have that going for us. I’m With Her: Married to Devin DeVasquez. In The Pink: Moss has two daughters, Creason, 22, and Calee, 17, with former wife Shari Shattuck (ex-Ashley, Y&R). Music In Him: Moss became a member of the rock band Player in the late ’70s, which produced the classic No. 1 hit “Baby Come Back”. Spice Of Life: You can purchase RoNN’s Kickass BBQ Sauce and Devin’s Kickass Cajun Seasoning at devronn.com. Keeping His Interest: Hobbies include photography, martial arts, target gun shooting and horseback riding.